this is expressed while comparing the risks of rupture in an unscarred versus scarred uterus. But is this true? How different can two numbers less than 1% be? Just because two numbers are less than 1%, that doesn’t make them any more similar than two numbers greater than 1%. A 2% risk of something happening is very different than an 89% risk. While they are both greater than 1%, they represent drastically different levels of risk. 89% represents a 44 times greater risk than 2%. What about numbers less than 1%? It might seem rational that since numbers less than 1% are so small, that there wouldn’t be as much of a difference between them. But numbers less than 1% work in the same way as those greater than 1%. Let’s run a few and measure the difference. 1 in 100 represents 1%. 1 in 1,000, is the same as 0.1%, and is 10 times smaller than 1%. 1 in 10,000, is the same as 0.01%, and is 100 times smaller than 1%. 1 in 100,000, is the same as 0.001%, and is 1,000 times smaller than 1%. 1 in 1,000,000, is the same as 0.0001%, and is 10,000 times smaller than 1%. – a scarred mom is 1 in 156 (0.64% or 64 in 10,000). (Both statistics include non-induced/augmented, induced, and augmented labors.) Even though both numbers are less than zero, they represent very different levels of risk. 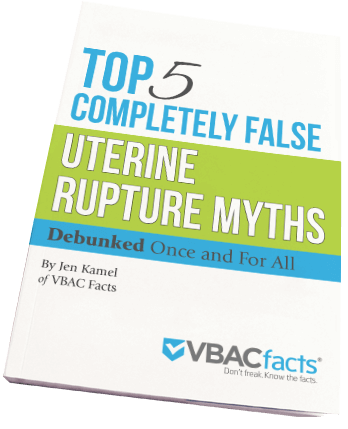 In fact, the risk of rupture in an unscarred mom is 91 times smaller than a scarred mom. It’s not that the risk of rupture is excessively high in a scarred mom, but that it is so very, very, very low in an unscarred mom. Just because two numbers are less than 1% does not mean that they are similar. Numbers below 1% represent just as much of a range as numbers greater than 1%. While the risk of scar rupture is very different than the risk of unscarred rupture, it is similar to other serious obstetrical emergencies such as placental abruption, cord prolapse, and postpartum hemorrhage. Thanks for this valuable post on understanding the numbers. What a critical skill this is, especially when numbers are tossed around so randomly by many people trying to “prove” their point! THANK YOU!